The Indiana born engineer and instrument maker Hugo Cook (1856-1944) was a holder of many US patents from 1883 until 1925 for various devices (like sewing machine implements, bicycle spokes, autographic register, etc. ), between them quite a few calculating machines. His first patent for adding machine (US430001) was granted in 1890. 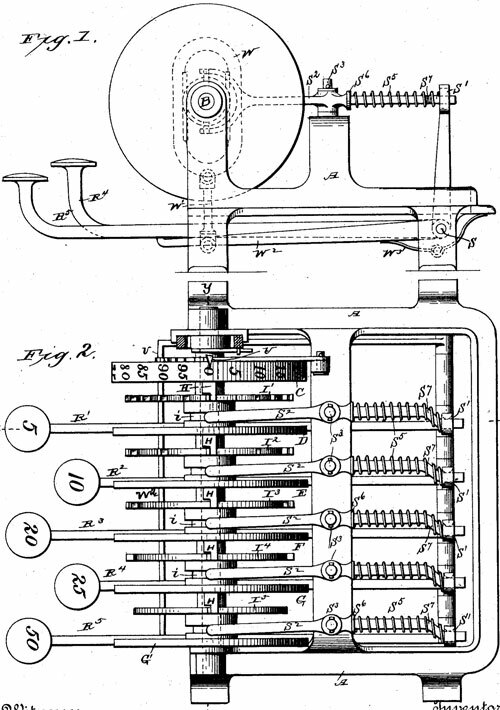 In 1891 Hugo Cook designed one of the first in the world adding machines (cash register with indicator and recorder, patent US464294) with a crank and printing device. Who was the prominent manufacturer and inventor Hugo Cook? Hugo Cook was born on 14 June 1856 in Dublin, Indiana, in a family of German emigrants—Ignatz (1819-1896), and Mary Cook (1826-1895). Ignatz Koch (Cook is the Americanized version of his surname) was born in W端rttemberg in 1819, and died on 1 Dec. 1896, in Indianapolis. Mary Cook was born in Baden, Germany (as Maria Stuber) in 1826 and died on 26 June, 1895, in Indianapolis. Ignatz Cook was a mechanic and worked in a machine workshop, and in 1870s was a sealer of weights and measures of Indianapolis. Hugo had an elder brother—Julius (b. 1853). Hugo Cook was educated in the public schools of Indianapolis, and in a technical school in Saint Louis, Mo. He also received instruction in mathematics and surveying from Prof. Stephens, of Indianapolis. After spending about three years in this line, Hugo Cook turned his attention to the manufacture of sewing machines, in which he was engaged for several years, during which time he invented several machines and made various improvements. He was practically the inventor of the first rotary shuttle machine. Following this period, Hugo Cook turned his attention to the invention of automatic machinery, and placed on the market various machines and devices of that character. For several years he manufactured special machinery, and turned out various automatic screw machines, and also a successful machine for the manufacture of bicycle spokes, etc. In the late 1880s Hugo Cook turned his attention to inventing calculating machines, and in the fall of 1888 he went to Dayton with his designs and associated himself with the National Cash Register, for the manufacture of his machines. In 1895 Hugo Cook organized in Dayton a company for manufacturing gas engines. Cook was president, Charles A. Craighead and William Kinnard were directors. The plant was located at No. 1136 East Third street, and the goods manufactured were from the patents of Cook. Hugo Cook was one of the most skilled and thorough men in the manufacturing business in Dayton, enjoying a reputation in the business world for progressiveness and enterprise, coupled with integrity and sound business principles. He was a member of the Masonic order, being a Knight Templar and a member of Reed Commandery. In early 1880s Hugo Cook acquired a large parcel and built a house in the Town of Oakwood, today part of City of Dayton, Ohio. In Oakwood his neighbors include Orville Wright, the coinventor of the airplane, and John Patterson, the founder of the National Cash Register Co., who used the numerous inventions of Cook in his machines. Hugo Cook married in 1879 to Anna Maria Wilmer (b. July, 1854 - d. 5 Oct. 1901). 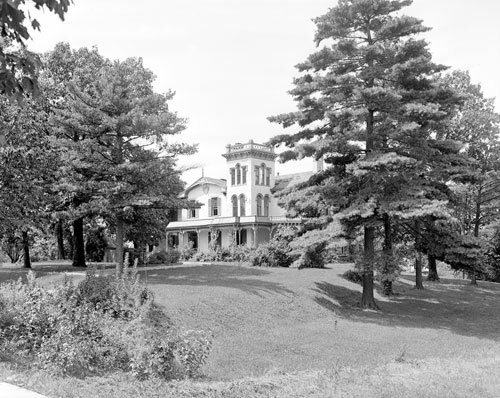 In Oakwood Hugo Cook lived with his wife, in a house (see a photo of the house below) on 815 Harman Avenue, and had a carriage house and experimental workshop nearby, in which he spent a large portion of his time. Hugo Cook died on 2 March, 1944, in Indianapolis and was buried in Crown Hill Cemetery.